In your online shop, you will find the entire brodos.net range incl all articles listed on the Marketplace, just like they can be seen on the Kiosk systems. In your online shop, you will find the entire brodos.net range incl all articles listed on the Marketplace, just like they can be seen on the Kiosk systems. That way, you can offer your customers the same shopping experience across all channels. A detailed list of all features can be found in the tariff overview. *) The minimum term is 12 months. After this period the contract can be terminated on a monthly basis. The termination must be in written form. Thanks to our Geo-tagging service for your store, customers from your town or region can easily find you online – and not only at home, but also when on the move using either their tablet or smartphone. That way, your online shop becomes the online shop for your local community. The connected store concept includes the in-store kiosk, but also the newly overhauled online shop with online shop maker as the retailer’s own home page on the internet. 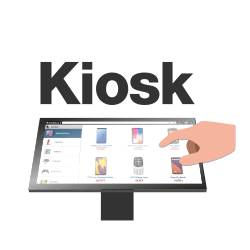 We have now developed the Kiosk2Go app to allow end customers to have the Kiosk with them at all times on their smartphone even when they are out and about. With the brodos.net online shop the order processing runs automatically with Brodos Logic upon request.